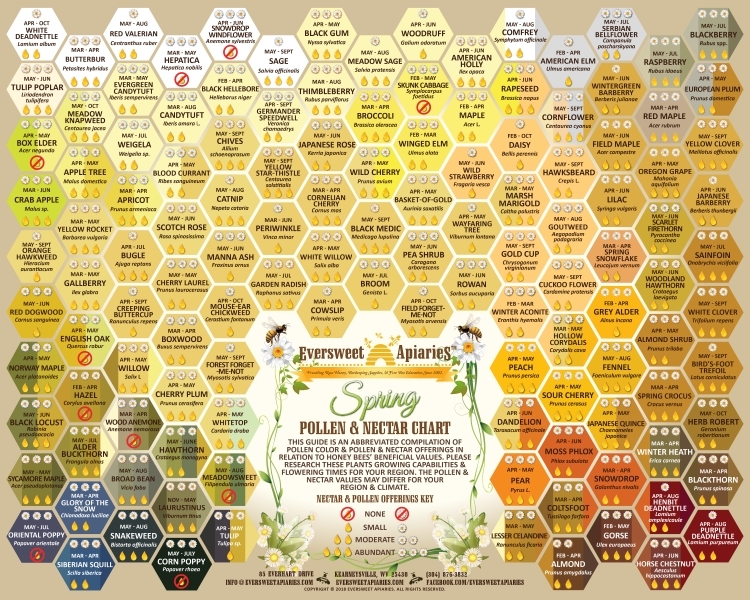 We’ve compiled an abbreviated chart listing pollen color & pollen & nectar offerings in relation to honey bees’ beneficial values. Please research these plants growing capabilities & flowering times for your region. 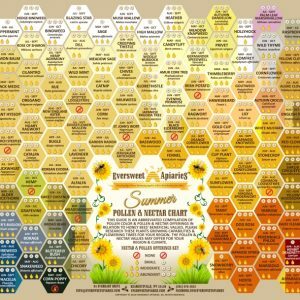 The pollen & nectar values may differ for your region & climate. Currently, Paypal is the only form of payment accepted for online ordering. For orders paid by checks, please click here to download the order form. Only United States currency is accepted for mail-in orders. Orders will be shipped after check clears. For orders shipped within the United States, your order should arrive within 2-3 weeks. For international orders, please allow up to 4-6 weeks. All orders are shipped via the United States Postal Service. Eversweet is not responsible for lost, stolen, or damaged orders. You may contact us at info@eversweetapiaries.com regarding your order. 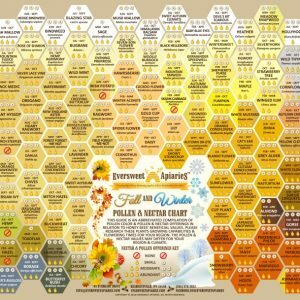 Please note if ordering Pollen Charts with different items, the charts must be shipped separately due to their size & packaging. No refunds. All sales are final. These charts were created for educational purposes. Any money received is to cover their production costs. 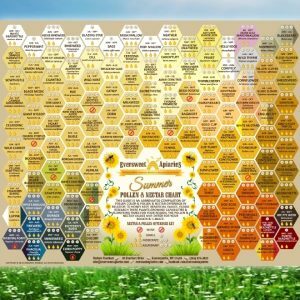 If you find any errors within these charts relating to grammatical, pollen color, pollen/nectar beneficial values, etc., please direct them to our attention so we may correct them for further editions. Please direct any communication regarding errors to info@eversweetapiaries.com.